There are all kinds of ways to get notified about what's of interest to you: Twitter, RSS, IFTTT, Yo, specific apps, your favorite sites, your next-door neighbor and so on. Hooks is a clean and simple app for iOS that focuses on notifications and nothing else; it can prompt you with alerts for everything from sports scores to website fails. Get the app up and running on your device and adding 'hooks' is simple enough (the developers promise if there's something you can't find, they'll consider adding it for you). 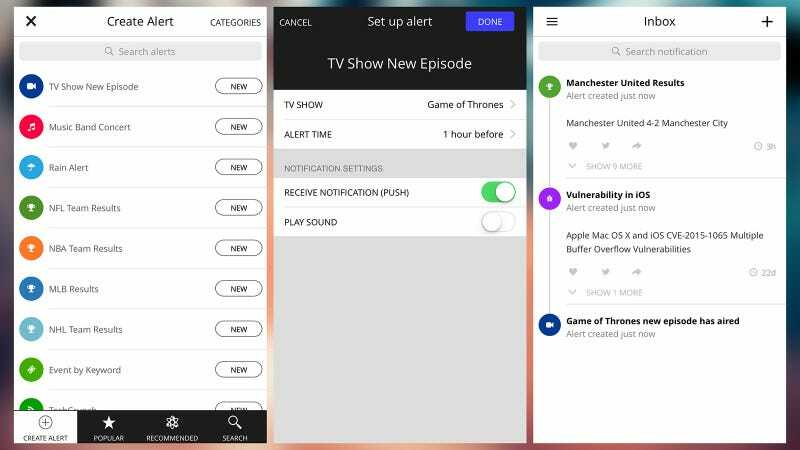 You can get updates for television shows, weather changes, Twitter keyboards, new movies, new restaurants in your area and much more besides. Open up the Popular tab to see some of the ingenious ways that people are using the app: New films with high scores, new vulnerabilities in iOS, a new update for your flight, a new tweet from someone specific. The list is a comprehensive one. In most cases you can configure the alert to suit your needs and choose between a silent or audible notification. While Hooks is simple on the surface, once you dig down there's plenty of versatility here. For the extreme weather alert, for example, you can specify a city, a type of weather, the number of days' advance warning you get and even which days the alert runs for. Its functionality is duplicated by other apps, but Hooks is a handy one-stop, straightforward solution.